Say goodbye to big, bulky carts that take up precious space. Tuck away for easy storage, but ready and available for when you need it. Fold down the padded handle in seconds to lay flush on the platform. Built for easy maneuverability and maximum stability. 2 back wheels engineered with 360-degree swivel functionality for easy transit. Custom support guard ensures items won't slip backwards. 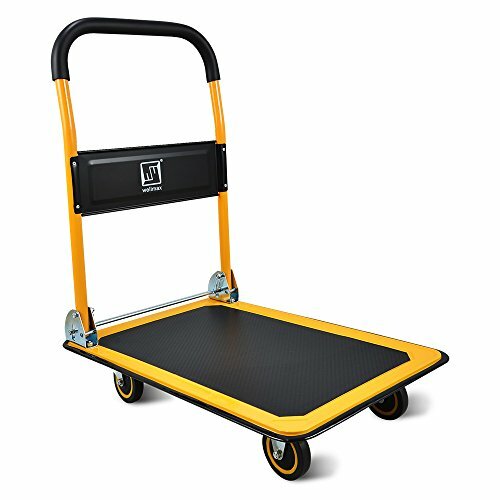 Handle your items with confidence - a platform cart that can hold up to 330lbs. Engineered using only the highest quality materials. A durable multipurpose utility cart for anywhere, anytime use. Move household items, wood planks, gardening tools, luggage, office supplies with ease. Perfect for easy storage in your garage, basement, office, storage closet or warehouse. View More In Platform Trucks. If you have any questions about this product by Wellmax, contact us by completing and submitting the form below. If you are looking for a specif part number, please include it with your message.